Polyphenols are compounds contained in the grape peel and their presence in wine depends on the wine-making technique. Phenolic compounds produced by grapes play an important role in the characterization of different red wines, not only because they determine their color, but also because they significantly influence their fragrance and above all taste. 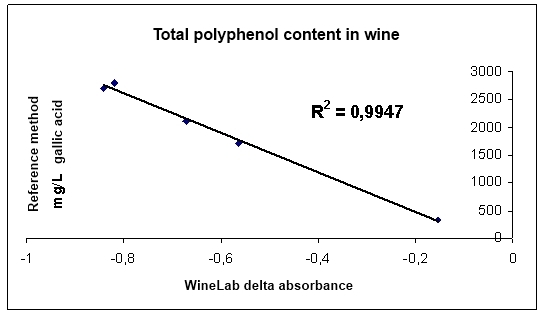 The polyphenol content along with the “chromatic profile” of a wine provides very useful elements to asses the genuineness and quality of a wine. Time testing: one test 5 minutes – 12 Test/Hour. Polyphenols are placed in contact with a colored complex in an alcoholic solution and oxidized, thus discoloring the complex. Discoloration, measured at 630 nm (end-point), is directly proportional to the concentration of polyphenols in the sample and expressed in mg/L of gallic acid. For sample with values > 3300 mg/L, use half of the volume of the sample (5 µL) and multiply the result by 2. Total Polyphenols was last modified: February 11th, 2019 by CDR s.r.l.